​​ MISSOURI CITY – Officials are working with nonprofit Missouri City Parks Foundation to construct a memorial to honor the nation’s veterans. 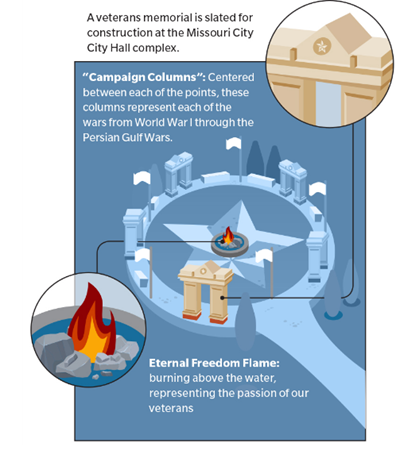 The design features a five-point star, outlined by arched columns, with a fountain and flame in the center, symbolizing the life, freedom, bravery, sacrifice and strength veterans represent. Location has yet to be decided. City staff chose the design by Lloyd Lentz, principal with LMA Design Houston. Former City Council Member Don Smith spearheaded this project. The project is worth $1.5 million and will be completed in two phases. City officials plan to pay for it entirely through donations. The goal is to complete fundraising by June 2018. ​​​Find this story on page 26: 2018 Annual Community Guide, Sugar Land Missouri City Edition, Volume 5, Issue 5, Jan. 11-Feb. 4, 2018.